Save BIG when you buy today!. The DR Pro's 36" monitor stand provides optimal, ear-level placement of a near-field (compact) studio speaker. It eliminates interference from resonant surfaces like desks and tables and this speaker stand is a stylish, space-saving solution for any recording studio. 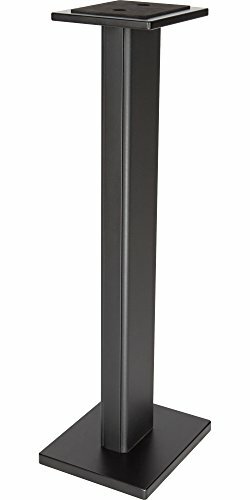 It features a hollow, gasket-sealed, steel pillar that's ready for sand or shot fill (fill not included) for added stability while on the pillar; plus carpet spikes, vinyl-glide feet, cable clips, and an assembly tool. The wood-grain finish of DR Pro's monitor speaker stand will keep the professional style of your home or project studio looking consistent. This is a pair. If you have any questions about this product by DR Pro, contact us by completing and submitting the form below. If you are looking for a specif part number, please include it with your message.